Twist and turn wire to create your own findings! Students will learn the basics of working with wire, wire gauges, hardness and more. 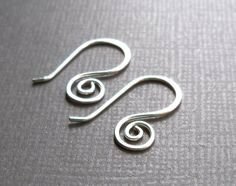 Create your own findings to make custom jump rings, ear wires and linking components to create a pair of earrings, pendants and more. Students will complete several pair of earrings. All wire and tools supplied. Beads are not included and may be purchased at studio. Includes wire and tools. Does NOT include beads. Beads may be purchased at studio or you may bring your own.